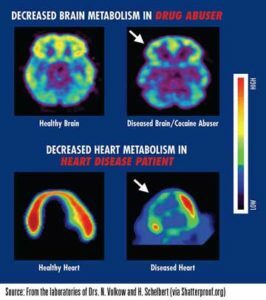 • Drugs change the brain structure and how it works. These brain changes can be seen in brain imaging scans and can be long lasting leading to many harmful, often self-destructive behaviors. • Addiction is similar to other diseases, such as heart disease. Both disrupt the normal, healthy functioning of the underlying organ, have serious harmful consequences, and if left untreated, can last a lifetime. • The initial decision to take drugs is mostly voluntary. Brain imaging studies from drug-addicted individuals show physical changes in areas of the brain that are critical to judgment, decision making, learning and memory, and behavior control. • Drug use compromises the long-term health of the brain and leads to addiction. As drug use increases, the brain adjusts to the overwhelming surges in dopamine by producing less dopamine or by reducing the number of receptors that can receive signals. • Eventually, dopamine simply doesn’t work as well on the reward circuit of a drug abusers brain, and the ability to experience any pleasure is reduced. • The science is indisputable. Addiction is a disease of the brain. Dysfunction in the brain chemistry leads to characteristic biological, psychological, social, and spiritual manifestations. Like other chronic diseases, addiction often involves cycles of relapse and remission. • GENETICS. Heredity is a major risk factor for addiction. Up to 50-60% of a person’s risk of addiction to alcohol, nicotine, or other drugs is based on genetics, meaning if family members have experienced addiction, the likelihood is they will more likely experience it, too. • ENVIRONMENT. Young people who experience neglect or abuse from parents may use drugs to cope with their emotions. This trauma could be in the form of physical, sexual or emotional abuse. If a parent is abusing substances, it can lead to greater risk taking or experimentation with alcohol and drugs from the child. Peer pressure is risk factor, even when it’s not aggressive, pressure from friends to fit in can create an environment of experimentation. • DUAL DIAGNOSIS. If an individual has a substance abuse disorder and another mental health condition, such as depression or bipolar or PTSD, it is referred a having a “dual diagnosis” in the medical community. Underlying mental health issues can increase the risk of addiction. • EARLY USE. Another risk factor for addiction is the age at which an individual starts to use substances. Addiction is a developmental disease and it typically begins in childhood or adolescence. 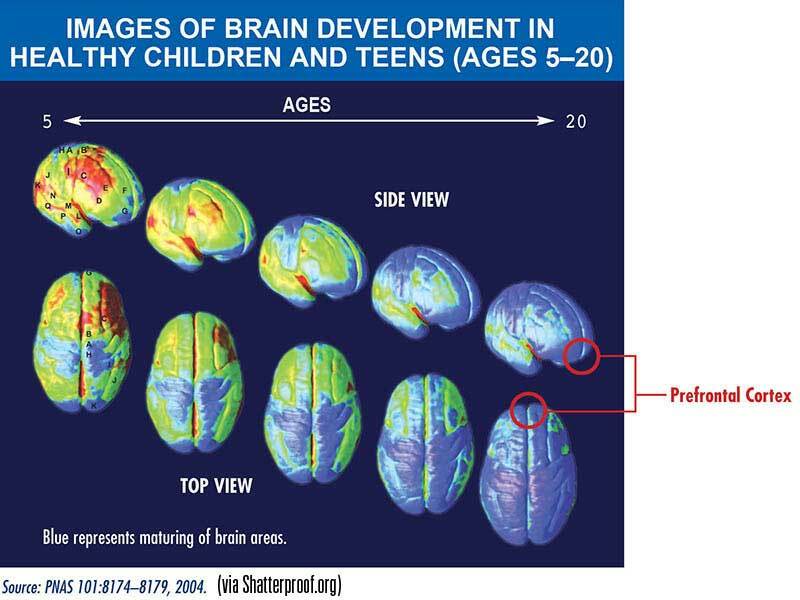 This may reflect the harmful effect that drugs can have on the developing brain. The part of our brain that controls judgment and reasoning — the prefrontal cortex — is still developing. Scientists have shown that our brains don’t reach their full adult potential until our twenties. • DRUG OF CHOICE. Some drugs tend to be more physically addictive than others and progress more quickly as an addiction. Drugs such as cocaine, heroin, and methamphetamines tend to be more physically addictive than alcohol or marijuana. Smoking or injecting a drug into a vein increases its addictive potential. • INDIVIDUAL AND GROUP COUNSELING. Counselors provide a variety of services to people in treatment for substance use disorders including assessment, treatment planning, and counseling focused on adherence to a recovery plan. The common therapies include cognitive-behavioral therapy, contingency management, motivational enhancement therapy, and 12 Step facilitation therapy. • INPATIENT AND RESIDENTIAL TREATMENT. Treatment can be provided in treatment facilities or specialized units within hospitals where the patient stays for anywhere from 30 days to six months. This usually includes detoxification, also known as medically managed withdrawal, as well as intensive treatment and preparation for a return to a community-based setting. • INTENSIVE OUTPATIENT TREATMENT. These programs have people attend very intensive and regular treatment sessions multiple times a week early in their treatment for an initial period and then step down to meet less frequently. • MEDICATION. Using medication to treat substance use disorders is often referred to as Medication-Assisted Treatment (MAT). In this model, medication is used in combination with counseling and behavioral therapies. Medications can reduce the cravings and other symptoms associated with withdrawal. MAT is has been primarily used for the treatment of opioid use disorder. • RECOVERY SERVICES. Recovery support services are non-clinical services that are used with treatment to support individuals in their recovery goals. These services are often provided by peers, or others who are already in recovery. Recovery support can include transitional (sober) living, coaching, and 12-Step groups like Alcoholic Anonymous, and other mutual support groups.